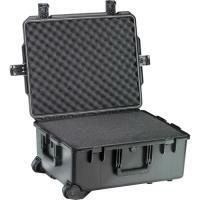 Pelican iM2720 Storm Case 22" x 17" x 10" FREE SHIPPING! Home > Pelican > Equipment Bags > Police Equipment Bags > iM2720 Storm Case 22" x 17" x 10"
Pelican iM2720 Storm Case 22" x 17" x 10"
Since 1976, the California-born Pelican Inc., has made a lasting impression for those in need of rugged products that will last a lifetime. Renowned for crafting quality, weather-proof cases, the Storm Case series is your ultimate companion for safely transporting valuable equipment--from firearms to cameras. The watertight iM2720 is constructed of lightweight, injection-molded HPX® resin. Its dense, polyester foam interior maximizes shock absorption and secures items as you travel from point A to B. Four press and pull latches combined with two pad-lockable closures guard items against theft. Convenient carry is made possible and comfortable with three, dual-layered soft-grip handles. The additional telescoping handle and in-line wheels further assist with stability and ease of transit when terrain is rough. ©2002-2019 CopsPlus.com: Pelican iM2720 Storm Case 22" x 17" x 10" FREE SHIPPING!